Robyn and her family enjoy their second day at Universal Studios in Orlando Florida! 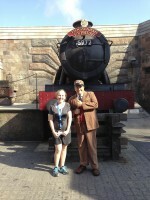 Dream Agent Robyn Ayers travels to Disney World and Universal Studios in Orlando, Florida! Amanda and Amy enjoy their second day in Mexico with spa treatments and a special private dinner in Amy's Presidential Villa. Co-Owner, Amy McHugh and Amanda McAdoo travel to Mexico and are staying at the beautiful El Dorado Maroma. Co-Owner, Mike McHugh, continues to enjoy his exciting and exclusive Chairman’s Club Retreat for some of the top agents with Sandals/Beaches Resorts. Great news, for new applicable reservations as of 5/20/13. Please contact your Dream agent ASAP to take advantage of this amazing promotion! Mike & Ardan take on Day 4 in Paradise and Mike gets a first-hand tour of the brand new Key West Village at Beaches Turks & Caicos! Day 3 was nothing but fun in the sun for Co Owner, Mike McHugh and his 8 year old son, Ardan at Beaches Turks & Caicos. Mike and Ardan enjoy their 2nd day at Beaches Turks & Caicos with many different water activities, a movie and a Japanese cuisine.